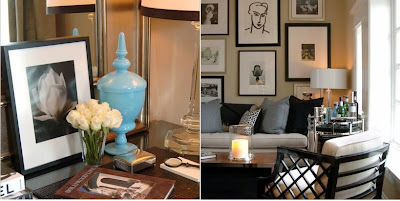 I was recently introduced to interior design guru David Jimenez, and his designs are to die for! He has influenced the visual aesthetic of Pottery Barn and Restoration Hardware, and the Palm Springs Regency Mid-Century Modern is also one of his accomplishments. Get this! He is also VP of visual merchandising and store design for Hallmark Cards, Inc. in Kansas City, where he resides. What I really love about his exquisite designs are that they remind me a lot of my own style--very regal, almost over the top, and always chic and glamourous. The photos posted are some of my favorite images from his beautiful body of work. You almost can't look away. I love the beams and exposed brick in that one picture...very industrial looking.